I’ve always liked the idea of homemade pizza, but I’m intimidated by the dough-making process. I just won’t make dough from scratch, okay? You’re probably thinking, “what about pizza dough from the grocery store?” Call me strange, but there’s something about Boboli that I don’t find appealing. I visited my friend Jen last weekend. Two things from my trip inspired me to make my own pizza at home using lavash. 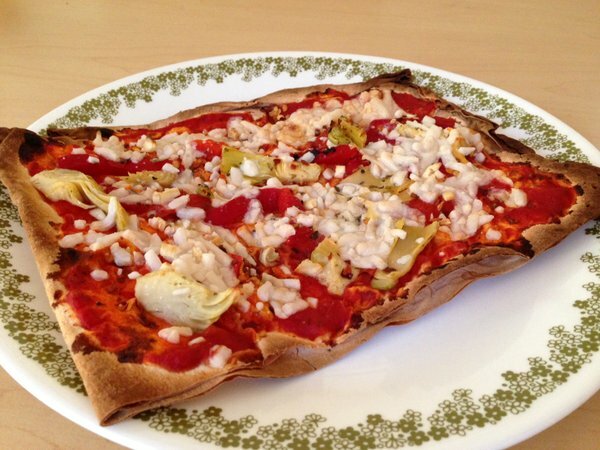 The first inspiration came from the pizzas Jen made using flatbread from Target. The flatbread made the perfect thin crust. The second was the lavash that was served with our hummus at Crave instead of the usual pita or pita chips. Lavash is light and tastes great when it’s soft and warm as well as when it’s baked to a crisp. I will be eating homemade pizza all the freaking time now. I was excited to find locally made lavash at Fresh Farms in Niles. If you’re in the Chicago area, take the trip up to Fresh Farms. They have a huge selection and you’ll find a lot of vegan products there at a lower price than those other stores. 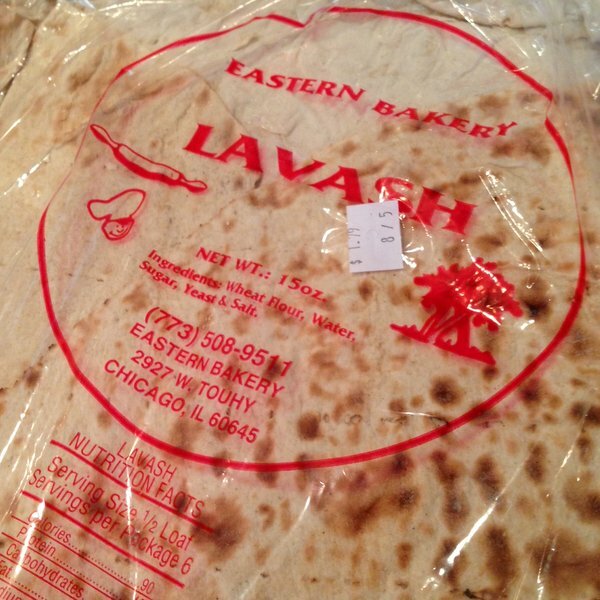 One pack of lavash costs $1.79 and I can make about six pizzas with it. Now, I’m not a big fan of grocery shopping so I was about to settle for dairy cheese instead of stopping someplace else to pick up daiya (I know, I know, I’m a terrible vegan). But, Fresh Farms rescued me! I found shredded cheese made by Follow Your Heart. 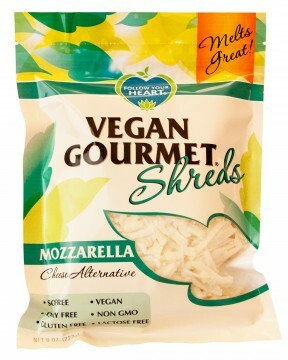 I like Follow Your Heart vegan cheese wedges, but this is the first time I’ve seen their shredded products. I love daiya, but I think I might like Follow Your Heart better. Daiya seems to be seasoned. I always know when I’m eating daiya because there’s a certain taste to it that isn’t found in real cheese. I didn’t notice that in the Follow Your Heart. The texture was good and the cheese melted really well. I got my lavash. I got my cheese. All I needed now was pizza sauce (you can use your favorite pasta sauce or tomato sauce) and toppings. Top your pizza however you would like. 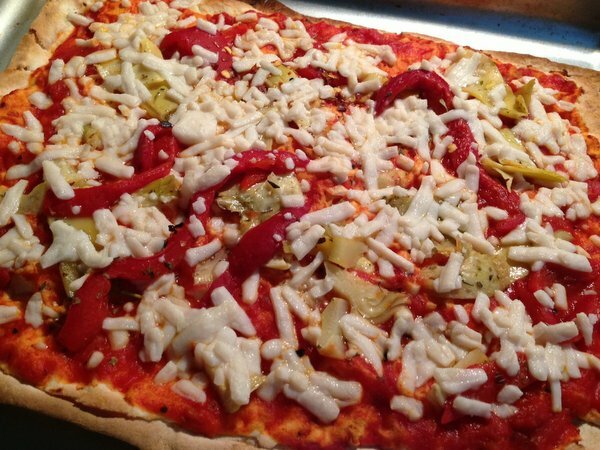 Today, I used roasted red peppers, marinated artichokes, crushed red pepper, and italian seasoning. I can’t wait to make others using fresh tomatoes or eggplant or basil or jalapenos from my Dad’s garden. Or… pineapple and vegan bacon! Or seasoned TVP! The possibilities are endless.